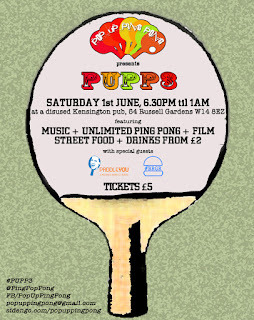 After a very successful couple of events Pop-up Ping Pong are back on 1st June at the disused The Kensington pub (near Olympia), with ping pong, a bar, a film screening, and burgers from #BRGR. See the pics on their Facebook page - it looked like lots of fun last time! 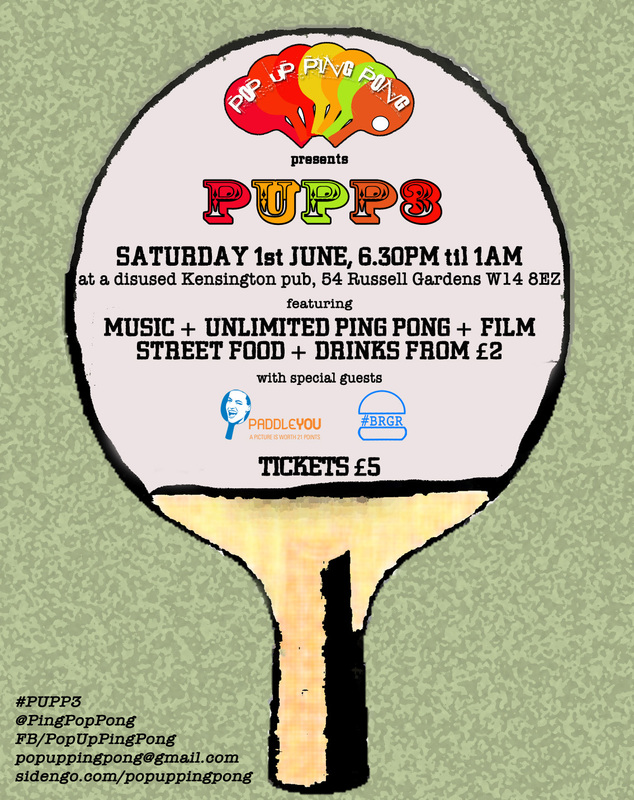 "Pop Up Ping Pong 3 is our final pop-up in the disused Kensington pub trilogy - and we plan to go out with a BANG! Entry is only £5, which entitles you to unlimited gaming subject to our house fair usage policy (hugging, not hogging). Due to popular demand, we've doubled the action in the beer pong corner to provide two regulation-sized tables complete with cup markings. The crowds that have gathered around this original venerated piece of PUPP paraphernalia have been truly legendary; we expect nothing less for round three. We'll also be projecting cult ping-pong movie Balls of Fury onto our walls for an extra dose of our favourite game with a sprinkling of Hollywood (think FBI secret mission and a whole lot of slapstick humour). Drinks start from £2 at the bar, with all beers at only £2.50 and vodka, rum or gin mixers from £4. We take plastic (cards accepted). #BRGR will be back with us to serve up their juicy ping-pong-sized mini burgers. Their buns are from the famed Miller's of Wimbledon and sit like toasted golden domes atop 3 oz grass-fed beef patties sourced from The Ginger Pig butchers. A dollop of ketchup and mustard with a layer of melty American cheese seals the deal."